Last week I spent a few days in the Eastern Sierra. My son leaves for the Navy early next week. The trip was the last chance to spend some time with him, outdoors, for quite a while. Other than the decision to move from one campground to another, it was a relaxing trip. We collected trout and mosquito bites before finally heading home. While the weather was perfect for a vacation, it wasn’t very conducive to good photography. California summer “blank blues” were the dominant weather pattern. Regardless of the conditions I still choose to get out and experience the calm of the morning. After walking around and doing some shooting in the South Tufa area of Mono Lake, I turned and saw that the sun would be cresting the mountains at any second. I literally ran towards the water’s edge to get in position. I dialed in the exposure and with just a few seconds to spare was ready to catch the first ray of light. To get the starburst on from the sun I dialed my aperture to f/22 (a setting I rarely use for any other reason). 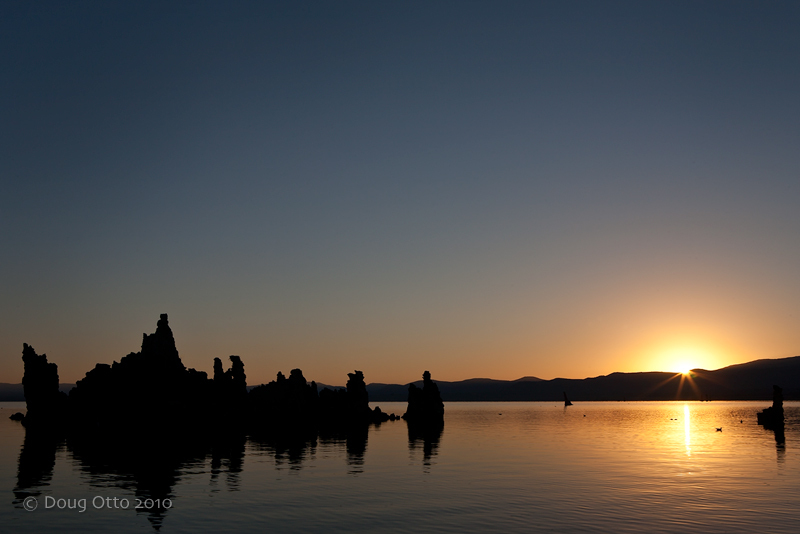 This entry was posted in Photography and tagged Canon 24-70 f/2.8L, Canon 5D, doug otto, Eastern Sierra, Mono Lake, Photography, silhouette, Sunrise. Bookmark the permalink.